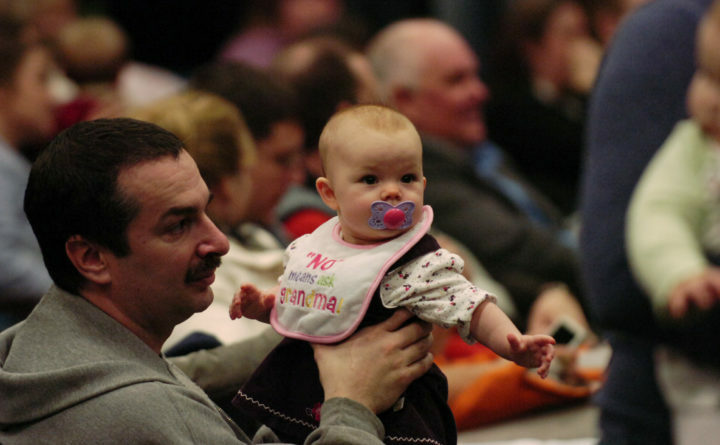 Mike Tribou of Gardiner holds his daughter Krystal Rae during the Harold Alfond College Challenge press conference and Baby Portrait Event for the Future Faces of Maine held on Thursday, December 11, 2008 at the University of Augusta. The event was to celebrate the nation's first statewide philanthropic college savings grant program that will allow all Maine Resident Babies born in 2009 to be eligible for $500 to be used for higher education. The next Congress will include a lot more progressive members, most notably in the Democratically controlled House of Representatives. Many of these members made income inequality a centerpiece of their campaigns and will likely continue to focus on the growing wealth gap. The wealth gap has increased significantly in the past decade. In 2007, the median net worth of upper income families was 40 percent larger than that of low-income households. In 2016, the median upper income net worth was 75 times higher than the median for low-income families. The median net worth of upper income households was $810,800 in 2016, which is about $70,000 more than in 2007, according to analysis by the Pew Research Center. Low-income households had a median net worth of only $10,800, which is actually down from $18,500 in 2007. One consequence of this wealth gap is an education gap as children from low-income families are far less likely to attend, or graduate from, college than their well-heeled peers. A significant reason is that lower-income students and their families are less able to save money for higher education. One of the most robust proposals to shrink the education and wealth gap comes from Sen. Cory Booker of New Jersey. He has proposed a “ baby bond.” Under his proposal, every infant in America would get a trust account with $1,000 from the federal government. Each year, the U.S. Treasury would make a contribution to the child’s account based on their family’s income. The poorest children could receive $2,000 a year. The poorest children would accumulate $50,000 by adulthood. The money could only be used to purchase a house or to pay for higher education or professional training. Growing evidence indicates these child development accounts, which are being used in about 30 locales in the US and include a mix of philanthropic and public funds, work. Thanks to support from the Harold Alfond Foundation, Maine has had these types of accounts for a decade. Every baby born in Maine is now automatically enrolled in a college savings account (parents can opt out). The Harold Alfond College Challenge deposits $500 into the account. The Alfond Foundation has invested $45 million for 90,000 Maine children. Families are encouraged to contribute to the account. If families contribute at least $50 a year, FAME will match 50 percent of their contributions, up to $300. So, if a family contributes $100 a year, FAME will add $50 to the account; if a family contributes $600, FAME will add $300. The benefits go far beyond the money invested. Young people with money in a college account are three times more likely to go to college and four times more likely to graduate, says Colleen Quint, president and CEO of the Alfond Scholarship Foundation. In Maine, nearly a quarter of families with incomes less than $25,000 a year have made contributions to their child’s college savings account after receiving the Alfond grant. Simply having money in a college savings account can change the outlook of families and their children. They are more likely to believe they can attend and succeed in college. This approach can also improve the social wellbeing of children and their mothers. Oklahoma has had a program similar to the Alfond Challenge since 2007, with a $1,000 contribution to a college savings account. The Center for Social Development at Washington University has extensively studied the SEED OK program and found benefits well beyond setting aside money for college. It found that disadvantaged young children who participated in SEED scored higher on social-environmental development. Their mothers also reported less depression and stress. The benefits of college savings accounts don’t just accrue to the families. Maine has a shortage of skilled workers, so growing the educated workforce is essential for our business community as well. As lawmakers in Washington debate ways to help working-class families, child development accounts, such as Maine’s Alfond Challenge, are a worthy and proven part of the debate. Maine’s experience should be instructive in the search for responsible, sustainable investments in America’s future that don’t entirely rely on government funding.